Registered by NSF-ISRISO International Standards ensure that products and services are safe, reliable and of good quality. For business, they are strategic tools that reduce costs by minimizing waste and errors and increasing productivity. They help companies to access new markets, level the playing field for developing countries and facilitate free and fair global trade. GSA Contract Holder contractor, also known as a vendor, is defined as a user who is not a government or GSA employee, or someone employed by them. Contractors are from private companies who get awarded orders placed by the clients. ENERGY STAR Partner ENERGY STAR is a dynamic government/industry partnership that offers businesses and consumers energy efficient solutions that make it easier to save money while protecting the environment for future generations. Compliance Approved by MIAMI-DADE Building Code Product Control Approval Process:Primary customers are manufacturers who submit technical documentation, including but not limited to test reports, engineering analysis, and installation procedures. FACTORY MUTUAL SYSTEM Approved for Metal RoofsFM Approvals is a leader in certification and approval of roofing products and roof assemblies. ICC ASTEC® Re-Ply™ Roofing Systems are FMR approved for Metal Roofs under FM 4470, “Approval Standard for Class 1 Roof Covers” (which) provides a basis for the evaluation of membrane-type roof systems. USGBC Member The U.S. Green Building Council (USGBC) is a 501(c)(3) non-profit organization that certifies sustainable businesses, homes, hospitals, schools, and neighborhoods. It is dedicated to expanding green building practices and education, and its LEED® (Leadership in Energy and Environmental Design) Green Building Rating System™. 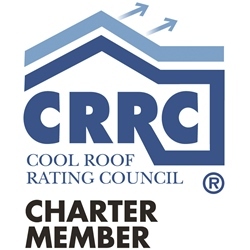 CRRC Charter Member The Cool Roof Rating Council (CRRC) was created in 1998 to develop accurate and credible methods for evaluating and labeling the solar reflectance and thermal emittance (radiative properties) of roofing products. The CRRC is incorporated as a non-profit educational organization for the following purposes: to implement and communicate fair, accurate, and credible radiative energy performance rating systems for roof surfaces, to support research into energy related radiative properties of roofing surfaces, including durability of those properties, and to provide education and objective support to parties interested in understanding and comparing various roofing options. RRCI Charter Member The Reflective Roof Coatings Institute (RRCI) members are coatings manufacturers, raw materials suppliers, applicators, and industry consultants. The mission of the Reflective Roof Coatings Institute is to promote the benefits of reflective roof coatings. RCI Member RCI, Incorporated is an international association of professional consultants, architects, and engineers who specialize in the specification and design of roofing, waterproofing and exterior wall systems.